European cheese culture and American cheese culture are two very different culinary philosophies. After being raised in a cheese culture built on Kraft Singles, Velveeta, and Cheese Whiz, more Americans are becoming hungry for the artisanal European cheeses of the past. At Old Europe Cheese, our mission is to satiate that hunger by handcrafting artisan specialty cheeses right here in the U.S. using the time-honored recipes, techniques, and equipment used in Europe. While European cheese culture is on one side of the spectrum and American cheese culture on the other, there’s one cheese that both cultures can agree on: Edam. Edam is a Dutch cheese that Americans have to come to know and love, as we can easily spot it a mile away by its signature red wax coating. We have been won over by these little red discs found tucked into our lunchboxes or enjoyed as a midday snack. As with many cheeses American palates favor, Edam is usually eaten young and is a great choice for younger audiences as well with its softer nuances. It’s not only the bright red exterior that catches our eye, but we’ve also learned to recognize Edam by its distinctive spherical shape, which occurs because the cheese firms quickly before the interior has fully settled. At Old Europe Cheese, we offer our Reny Picot Edam in its well-known globular form, but we have also taken our same wonderful Edam and formed it into a slicing square format for convenience purposes. Americans seem to be quite familiar with the excellence of Edam, but what many don’t know about Edam is that it tends to have a lower fat content than most cheeses. A brief history lesson: When Edam was first made, it was a traditional practice to skim off the fat from the evening’s milking and use the fat to make butter. The remaining skimmed milk was then mixed with the next morning’s milking to make a cheese that had a lower fat content and sharper flavor. At Old Europe Cheese, we pride ourselves on the fact that the production of Reny Picot Edam focuses on molding simple, traditional ingredients into a powerhouse of soothing flavors and textures. This beautiful transformation happens as we let the genuine Edam flavors settle on their own without any means of acceleration or artificial seasonings used in American cheeses. This gives Reny Picot Edam a European authenticity that still caters to American consumers. Now that you’re ready to explore the excellence of Reny Picot Edam, find it in a store near you. 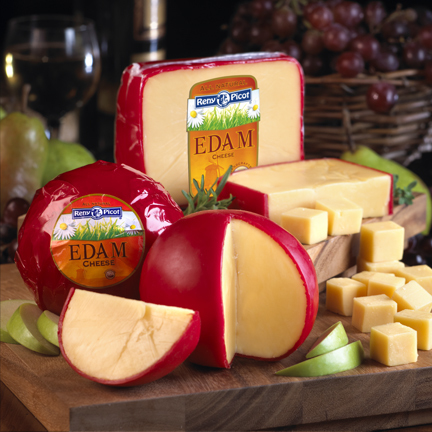 Also, if you have a favorite Edam recipe, let us know! Contact us today to share a recipe or if you have any questions for us here at Old Europe Cheese. We’d love to hear from you!